Sheryl Nantus | Las Vegas � more than just a pretty face! Sheryl Nantus | Viva Las Vegas! Sheryl Nantus was born in Montreal, Canada and grew up in Toronto, Canada. A rabid reader almost from birth, she attended Sheridan College in Oakville, graduating in 1984 in Media Arts Writing. She met Martin Nantus through the online fanfiction community in 1993 and moved to the United States in 2000 in order to marry. A firm believer in the healing properties of peppermint tea and chai she continues to write short stories and novels while searching for the perfect cuppa. 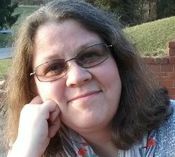 She has published multiple books with Swerve, Entangled Publishing, Samhain Publishing and Carina Press. In 2011 she won two second-place Prism Awards from the Fantasy, Futuristic and Paranormal chapter of RWA for her steampunk romance, �Wild Cards and Iron Horses� and the first volume of her superhero romance trilogy, �Blaze of Glory�. In 2013 she won a third-place Prism Award for her paranormal romance, ""Blood of the Pride"".